As you may know, Alice's troubles all began when she spotted a fastidiously dressed yet tardy rabbit, and decided to follow him down a rabbit hole. 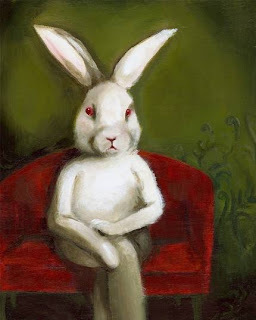 Although the white rabbit's name was never revealed, I do believe that it could be Edgar. After all, look how dignified this rabbit by the same name appears, and imagine how dapper he would be in the proper waistcoat. Edgar is an illustration by etsy seller, amberalexander. Did you know that if one of us came across the White Rabbit in today's world, we would probably label him "steampunk". That's right, his dapper appearance is in fact thoroughly modern. 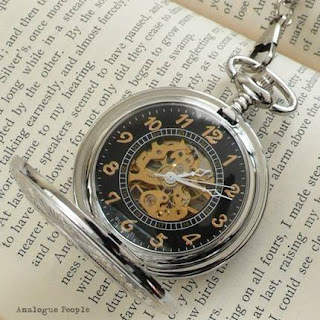 His pocket watch might have been re-purposed into earrings, or a necklace, or simply given a modern make-over like this one seen here by analoguepeople. What good is a pocket watch without a proper waistcoat pocket from which to suspend it? 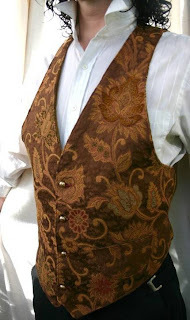 (A waistcoat by the way is simply the British word for vest.) I think our rabbit would look smashing in this Victorian-inspired tapestry waistcoat. This was created by dashandbag. Oh, I think that is one perfectly outfitted rabbit. But, ladies remember, don't fall for a slick looking rabbit. It will lead to trouble every time. Tomorrow, we will meet another troublesome character. So cute! I must admit that I never quite understood what steampunk meant even though it seems to be everywhere.